Ladybugs are insects that can often be found on the leaves of plants and crops. They are well-known and easily identified by their bright colors. 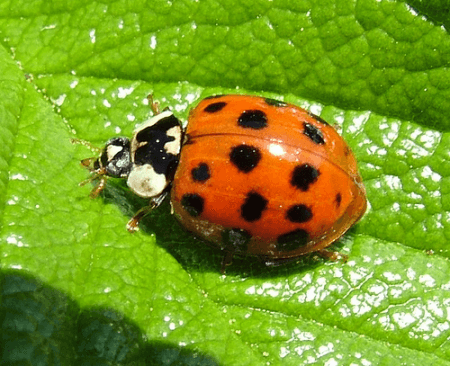 One type of ladybug is called the Asian beetle. It can be hard to differentiate the usual ladybug from an Asian beetle. In this article, you’ll discover their differences, plus a host of other information about the two. The ladybug is from the insect family Coccinellidae (lady beetles) and order Coleoptera (beetles). There are thousands of species of ladybugs all over the world. They are sometimes called “ladybirds” or “ladybeetles.” Most ladybugs have oval shaped bodies with six short legs. The size of ladybugs ranges from one to 18 millimeters. Some ladybugs are herbivores (plant-eaters) and others are omnivores (plant and insect eaters). The herbivorous types of ladybugs are considered as pests since they are voracious eaters of crop leaves. Ladybugs hibernate during the winter. This is around the time when home infestations occur. These insects often look for warm, comfortable sites during the cold seasons and they live off their body fats. 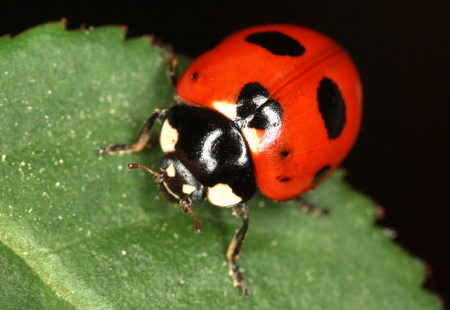 One very identifiable trait of a ladybug is its bright red color and dark spots. The number of spots varies depending on the species. The ladybug has been a subject of many nursery rhymes due to its cute and bright colored characteristic. Its shape has also been an inspiration in the production of certain vehicles like the Volkswagen Beetle. Asian beetles, also known as Harmonia axyridis, is a species of Ladybugs. They are referred to as the “many-named insect” since they are also sometimes called “Japanese ladybug,” “Harlequin ladybird,” “Asian ladybeetle,” or “multicolored Asian.” This insect ranges from 5.5 to 8.5 mm in size. Asian beetles are usually orange in color. They may or may not have spots. Those that have spots usually have more than the usual red ladybug. One distinct physical trait of this Asian beetles is the black M or W marking on its pronotum (mid-part). Asian beetles are omnivores. They eat both leaves and pests such as the aphids. They were introduced to North America and Europe to control the spread of such pests. Most of the time, though, Asian beetles are considered to be pests themselves. This particular species is considered to be one of the world’s most invasive insects. They come in swarms and multiply quickly, hence becoming a big problem in some homes. What is the difference between a ladybug and an Asian beetle? “Ladybug” is what we generally call the type of insect and “Asian beetle” is a specific species in this family. Most of the time, ladybugs are red in color with dark spots. Asian beetles are mostly orange and may or may not have dark spots. The usual ladybug has some marks on it pronotum but not as distinct as the M or W-shaped mark of the Asian beetle.